I have had oatmeal scones on my to do list for weeks. I finally got around to making some last week. 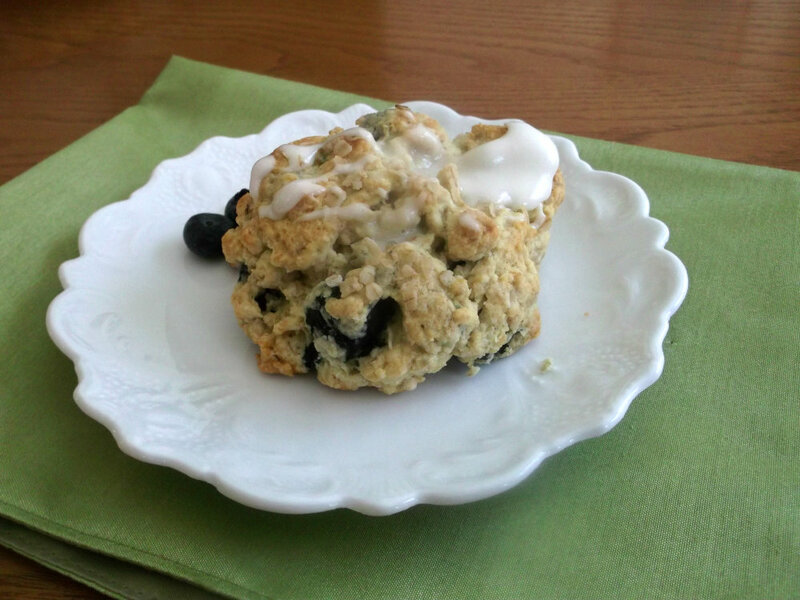 My first plan was to make raisin oatmeal scones, until I saw blueberry on sale at the local fruit market. The fresh fruit sounded so much nicer than the raisins. I was expecting the oats to make the scones a little heavier, but I was surprised how light these scones turned out. Topped with a little icing, these were the perfect treat for breakfast. To date I have to say that these are my favorite scones that I have made since I started my blog. I know down the road I will be making scones with raisins too, but as long as there is fresh fruit that is not too pricey I will stick with that. * Combine flour, sugar, baking powder, baking soda, and salt in a large bowl. Add the butter and cut in with a fork so that the mixture resembles coarse meal. Add the cup of oatmeal and blueberries; stir to blend evenly. *In a medium bowl beat the 2 eggs; add the cream and vanilla and blend together. Gradually add to the flour mixture, tossing until dough just comes together. *Using a 1/2-cup measuring cup for each scone, drop dough in mounds onto prepared baking sheets, about 3 inches apart. Sprinkle tops with the remaining tablespoons of oatmeal. *Bake scones for 20 to 23 minutes, until scones are golden and tester inserted into center comes out clean. Transfer scones to rack and cool completely. * In a small bowl combine 1/2 cup of powder sugar and 2 to 4 tablespoons of heavy cream. Beat until smooth and drizzle over cooled scones. I was aout to make oat cookies today, but maybe I should replace it with your scones. Looks amazing! So glad you went with Blueberries, just love them. I’m surprised to hear that these stay light even with the oats. Can’t wait to give them a try. I wish I had one for breakfast today! I don’t believe I’ve ever had an oatmeal scone. Great idea! 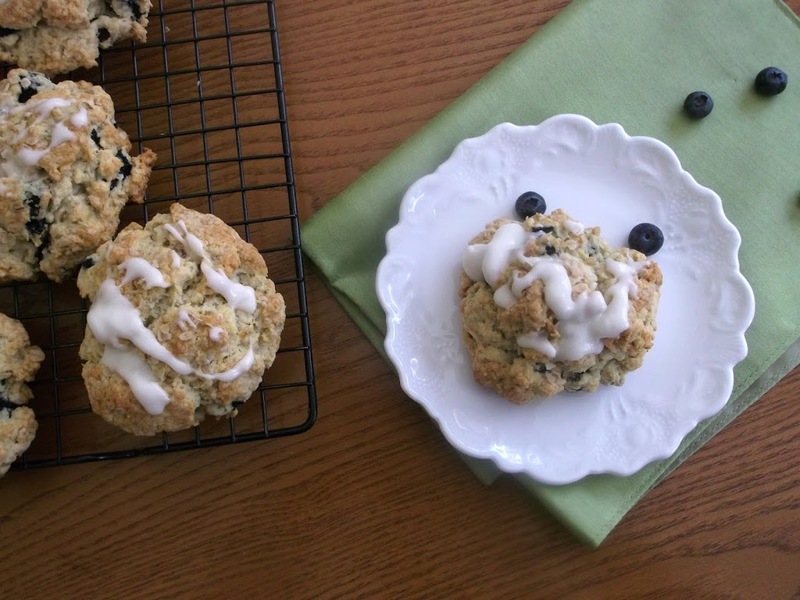 And blueberries in scones sounds terrific! Fun recipe – thanks. 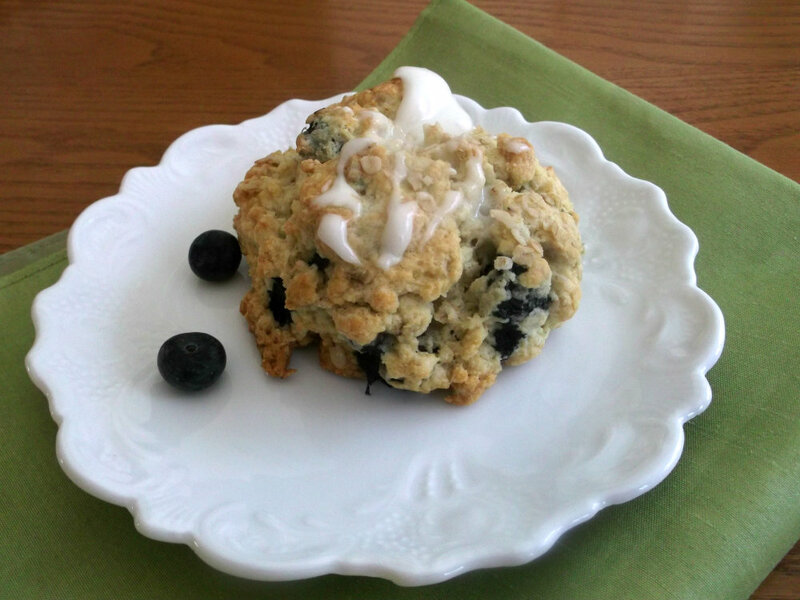 Looks delicious your scone with blueberries, and yes oatmeal sounds great…healthy!